Though the ocean plays a prominent role in my work, I don’t consider myself a seascape specialist. My main interest is not the waves (how ever fascinating they may be…) but how the light plays on the water. 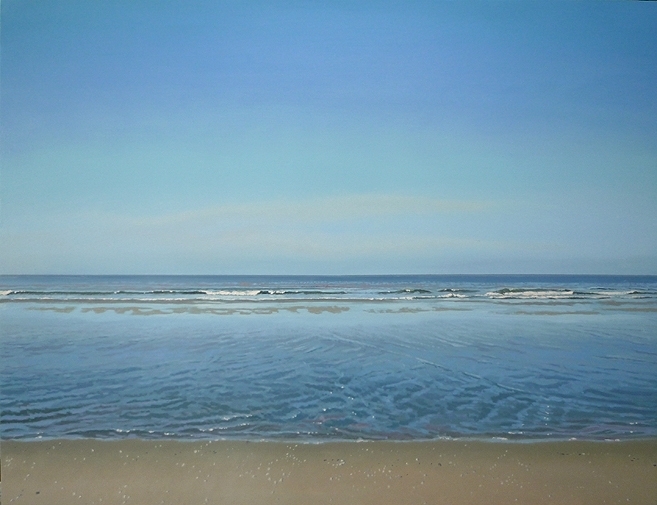 Besides, in quite a few of my paintings the horizon is so low that you can hardly call them seascapes. What fascinates me is how the ocean and the sky influence each other. I often stand in awe, watching the shadow of a giant cloud sail majestically over the water. “If I could just paint that…” Then I go home and fail. But through the years I have learned a few things that were very helpful in achieving my goal. One of them is layering: applying the paint in different, often transparent layers. 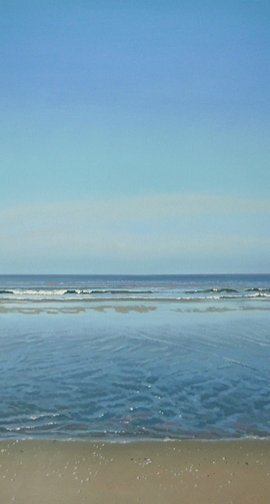 When, for example, I want to paint water on a beach, I will paint the beach first, often in some detail. When this initial layer is dry I will paint the water on top of it in a transparent layer.